Democrat Julian Castro said he would announce his presidential campaign on Saturday. NORTH LIBERTY, Iowa — Former San Antonio Mayor Julian Castro introduced himself to Iowa Democrats on Monday night as a champion for universal health care and affordable housing as he indicated he was close to launching a run for the presidency. Castro spoke with party activists at a crowded house party in North Liberty after forming an exploratory committee last month. Castro said that he would announce his presidential campaign on Saturday in San Antonio and that he looked forward to meeting with Iowa voters before the first-in-the-nation caucuses next year. Castro said that he would lay out his vision for making the United States "the smartest, the healthiest, the fairest and the most prosperous nation in the world." He said that his plans will include expanding Medicare to allow access for all and addressing what he called a housing affordability crisis in which rising rents are squeezing the poor and middle class. 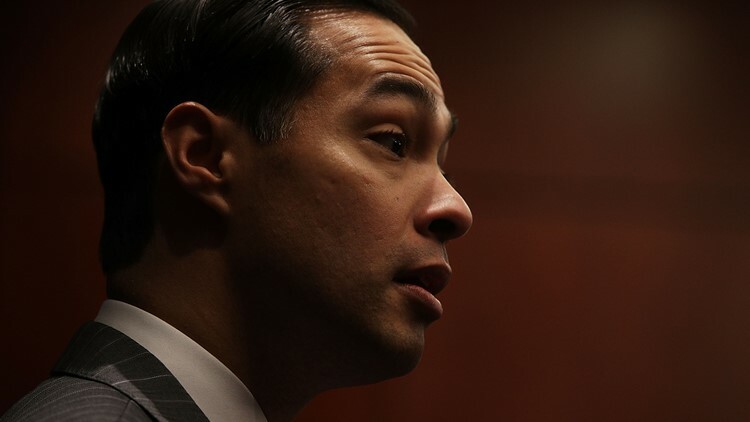 Castro, who served as the nation's housing secretary during President Barack Obama's second term, also promised that he will not accept money from political action committees tied to corporations and unions. "What you're going to hear from me is that I'm not taking that PAC money, that I support universal health care, and that I've shown in my time in public service an ability to stand with the people instead of the special interests, and I've taken action to do that," said Castro, 44. Castro shook hands, spoke and fielded questions for an hour as guests sipped wine from plastic cups. He received a warm welcome from the activists, who said they were eager for someone who could defeat President Donald Trump in the 2020 election. North Liberty is a fast-growing bedroom community that's located near Iowa City in Johnson County, which has long been the state's liberal stronghold. Castro's visit was the latest activity in Iowa as the field of candidates seeking the Democratic Party's nomination begins to take shape. U.S. Sen. Elizabeth Warren of Massachusetts visited the state over the weekend after forming her own exploratory committee, and several more candidates are expected to join the race soon. Castro acknowledged that some Democrats will view his and other candidates' decisions to not accept PAC money as tantamount to "bringing a knife to a gun fight." But he said that the Democratic nominee will have no problem raising money from individuals who want change and that the decision sends an important message. "I think it says something, that if a candidate doesn't take that money, they're going to work for you," he said. "If I'm elected, that's what I'm going to do."